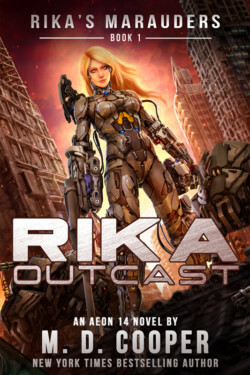 Rika has a new command in the Marauders, captain of a company of mechs. She’s finally with her people, doing what she loves most. But her assignment is not an easy one. A year ago, she was partially responsible for the fall of Thebes. Now it is her duty to protect it against the encroaching Nietzschean forces. A single mech company and a small fleet of ships are all that stand against an enemy armada. Rika knows that if she’s going to win this war, she can’t sit back. 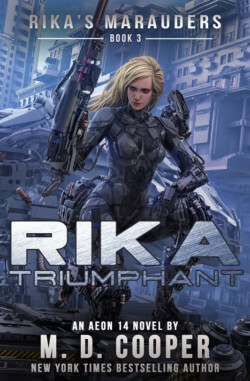 Rika must take the fight to the enemy. Now she slings cargo on Dekar Station, falling deeper in debt as she struggles to make enough money to keep her cybernetic body functioning. The local gangs would love to have her join their ranks, and the takings would pay her bills, but the only thing Rika hates more than what she’s become, is killing for others. But morals don’t buy repairs and she’s at the point of utter desperation when her loan holder cashes in her debt and sells her to the highest bidder. When Rika wakes, she’s in a warehouse on a planet she’s never heard of, and a trio of mercenaries are reassembling her body. Their mission is to kill the world’s president. Whether she likes it or not, Rika is in the business of killing once more.